Members of the Society receive the award-winning South Atlantic Chronicle, which the Society publishes four times a year. The South Atlantic Chronicle is the official publication of the Society and, as such, it contains original philatelic articles written by members of the Society and others, news concerning the Society itself, and other articles in keeping with the objectives of the Society. Members have exclusive access to the Society's Yahoo group and to the Special Interest Groups and can use the Sales & Wants page. In addition, they have access to an online cumulative index of all articles published in the Society's journals, and they receive preferential pricing on a two-DVD set containing a database with this same extensive journal content as well as proprietary software which makes viewing a breeze. 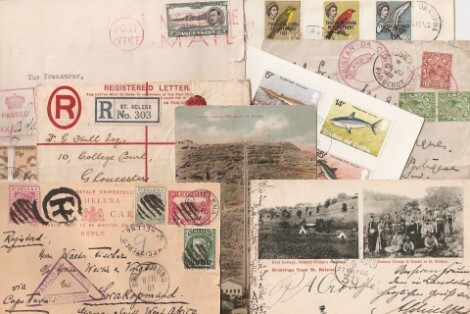 The Society from time to time holds an auction/mail bid sale to assist members in the acquisition and/or disposal of philatelic materials from St. Helena, Ascension, and Tristan da Cunha. Occasionally, philatelic items of other South Atlantic areas are included in the auction/mail bid sale. Also, occasionally, the auction/mail bid sale includes interesting non-philatelic ephemera (maps, art, prints, small souvenir items, books, etc.). 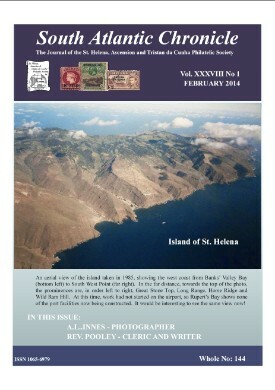 The Society is also prepared to manage the sale of major St. Helena, Ascension, and/or Tristan da Cunha philatelic properties by private treaty. We hope to make new services available to our members. In general, all that is needed to implement a new service is to identify an individual who is willing to volunteer to define how the service would operate and to run it. If you would like to participate, join us and let the Society President know of your ideas. Defining a service and seeing the project through to its fruition can be an exhilarating and rewarding experience. Along the way, you'll enjoy the fellowship of working with our members. We hope that you will seriously consider joining us and participating at the level which best suits you. We would welcome you as a member! Our membership year begins in January, and individuals joining after that normally receive all of the back issues of the South Atlantic Chronicle for the year. However, individuals joining after September 30th and nominating that their membership commences on January 1st next year will be sent one back issue of the Chronicle and will be members in good standing until the end of the next financial year. Members joining prior to October 1st will be entitled to receive all issues for the year of joining, but will have to renew their membership and pay the dues falling payable by January 1st of the following year. Members joining as Life members will be entitled to all issues for the year of joining, or one back issue if joining early in the year. When paying by PayPal, our annual dues are $28.65 for members residing in the U. S. and Canada and $33.65 for members residing in any other country. Dues may be paid by check in U.S. dollars or in sterling. All checks should be made payable to the "St. Helena Philatelic Society." If paying by check, our annual dues are $27.00 for members residing in the U. S. and Canada and $32.00 for members residing in any other country. A paperless option is available at $15 worldwide (PayPal $16), the quarterly journal is available on the web site (printed copy not provided). Payment with your credit card or with your PayPal account - this is made via Paypal and includes the transaction costs. Choose from U.S.A. and Canada, Rest of the World and paperless subscription payment from the options below (click on the arrow for the options). Life Memberships are available; please contact the Society's Secretary regarding Life Membership fees. The South Atlantic Chronicle is mailed by first class in North America and by air mail printed matter elsewhere. GREAT OFFER - join now for 2018 and get all PDF journals from 2016 (!!). If the form will not work, please generate and enter a new security code (= neues Bild) - and click again SUBMIT, thanks. ► you need more information? Please ask the Secretary. The Society compiles and publishes a Membership Directory annually, which lists the names, addresses and e-mail addresses of all members (unless the Society has been requested not to publish this data), and is distributed with the South Atlantic Chronicle.